The night’s are slowly starting to draw in and if, like me, all you can think of are rich, comforting and sumptuous meals then this one is for you. Over the last couple of years I have eaten my way round game varieties and this is the recipe I keep coming back to. Give it a go and if you’re lucky I’ll even share my other game recipes over the coming season! Wild duck is now in season so look out for it on your local market stalls. If you are based in or around St Albans, Ixhill Farm (@ixhillfarm) have a stall at the Farmer’s Market on the second Sunday of every month sell delicious, fresh, plump duck legs, whole duck and smoked duck which you must try. The ingredients for this recipe can easily be doubled to feed a family of four or for a cosy night in for two follow the recipe below. 1. Get cracking by warming up the oven to 180c/ 160 fan/ gas mark 4 ready for the duck to roast. Season the duck legs and lightly rub with the vegetable oil. Place on a rack or a baking tray and cook for 40 minutes. I use a rack so the juices from the meat can be easily collected for the next stage and to crisp up the skin. Do remember to check the duck cooking instructions as some cooking times will differ depending on the size of the legs; some duck will need an hour. 2. Remove the duck when ready and rest for a few minutes- check the juices run clear. When the duck is cool enough to handle (a bit longer if like me you don’t have asbestos hands!) take the duck meat off the bone and set aside- I defy you to resist the urge to have a nibble along the way! I also carefully remove the crispy, golden skin to use as ‘duck crisps’- all will become clear…. 3. With the duck to one side, you can get started on the base for the ragu. Reserve a tablespoon of the duck fat and add to a heavy based pan (I look for any excuse to break out my Le Creuset!) over a low heat and sweat the onion, garlic and celery until they soften. Add the tomato puree and cook this out for 2 minutes- this avoids the metallic bitterness that tomato puree can often bring to a dish so it is worth spending a couple of minutes over. Top tip: Remember that any remaining duck fat can always be saved for delicious, fluffy roast potatoes or a luxurious duck confit. 4. Add the parsley, a pinch of oregano and the wine and turn up the heat to reduce the wine by half. Add the tomatoes and duck meat and simmer on a low heat. Try and use the best tomatoes you can as this makes a world of difference to the end result- a tin of San Marzano tomatoes is perfect here for a well rounded depth of flavour if you can get hold of them, if not normal tinned tomatoes will also do the trick and give equally delicious results. Simmer the ragu for around 30- 35 minutes until the sauce thickens and has a glossy sheen. 5. When the ragu is nearly ready, bring a large pan of water up to the boil, add the pasta and simmer for 10 minutes or as per the packaging instructions. Do not overcook it! I like my pasta al dente so it contrasts with the texture of the ragu. Drain the pasta and serve in warmed bowls with the ragu- I do it the Italian way and add the pasta to the ragu rather than the other way around. Now this is where the duck skin comes in! I cut the skin into shards and use them as a garnish. if the skin has not gone quite as crispy as you would like then pop it on a baking sheet in the oven at 180c/ fan 160/ gas mark 4 for a few minutes. It is a wonderful contrast between the rich, unctuous duck and the crisp, seasoned skin so do give it a go! You may also like to offer a light sprinkling of parmesan to serve. This rich, luxurious ragu recipe will see you through the changing seasons and beyond! 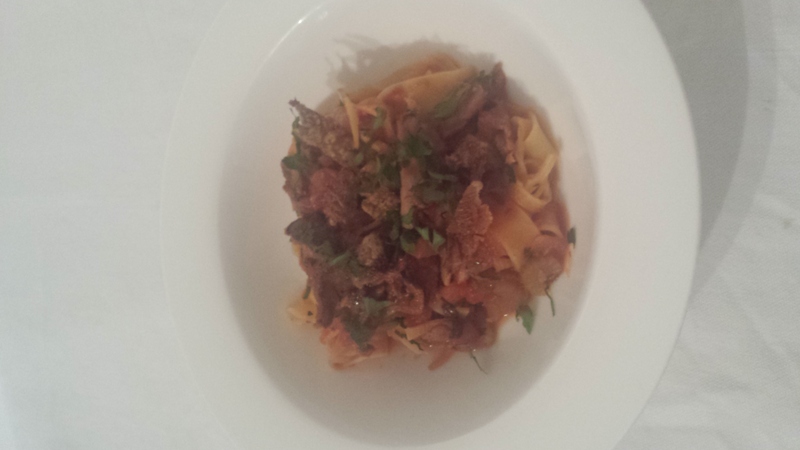 Welcome to the first blog post from What Chloe Cooked! Let’s start with a deliciously simple and seasonal dish that’s perfect for midweek when time is short or for a lazy weekend dinner when a little indulgence is needed. Using only the freshest ingredients, this recipe is a sure fire hit. 1. First thing’s first- get the potatoes on to steam. You can do this either with a colander over a pan of boiling water or use a traditional steamer. If you choose to steam over a colander then make sure the colander is resting above the water line- the potatoes should not be touching the water! 2. Take the trout fillets and carefully slash the skin a few times. Season well with salt and pepper and sprinkle over a pinch of cayenne. 3. Heat the oil in a good, non- stick frying pan over a medium heat. When the oil is hot, add the trout fillets skin side down- you are aiming for a beautifully golden skin which should take 5-6 minutes. As tempting as it can be to move the fish around the pan, resist the urge! 4. When the trout is golden carefully turn it over in the pan and continue to pan fry for a couple more minutes until the fish turns a blush pink. Remove the fish from the pan and keep warm on serving plates before starting the sauce. You need to use the same frying pan again for the sauce so wipe this out well. 5. Check your potatoes at this point and add the samphire to the steamer. The samphire will only need a couple of minutes until it is tender. If you find samphire too salty you can also give it a rinse before steaming it. 6. Melt the butter over a medium heat and add the finely chopped shallot for one minute until beginning to soften. Add the white wine, brown shrimps, cockles and a squeeze of lemon juice to taste; reduce the wine by half. I urge you to try cockles in this dish as they complement the sweet taste of the brown shrimp perfectly. Gone are the days of vinegary morsels in jars that you picked at with a cocktail stick! Alternatively you may also like to try using just brown shrimp and I would use 90g of these as a substitute. 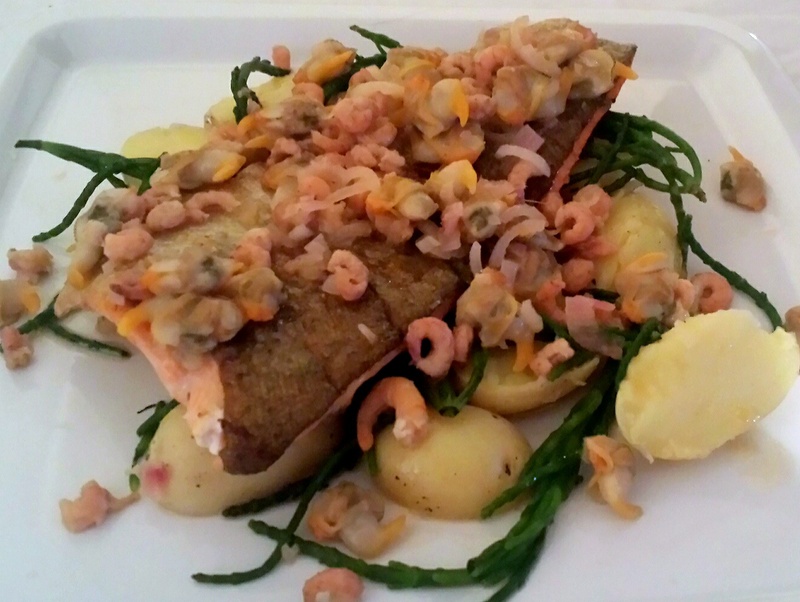 You won’t need to add extra seasoning as you will have already seasoned the trout fillets and the samphire brings a natural saltiness to the dish. 7. Now for the plating up! Dinner is nearly served! Spoon the steamed potatoes and samphire onto the plates and drizzle a little of the buttery sauce over. The trout should then be placed on top of the bed of vegetables before adding the rest of the sauce over the top. Be prepared for this recipe to become a feature of your weekly menu.